The Primary purpose of thickening is to increase the concentration of large quantity of suspended solids in the feed stream. 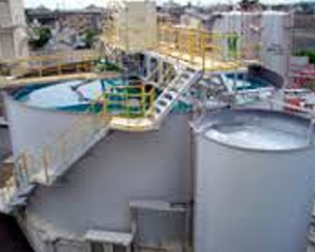 It functions very similar to that of a clarifier but process result is different. Thickening process involves higher torques than Clariflocculator. Hence the gearbox and mechanism are of heavy duty. Thickener consist of a tank for introducing the feed with minimum turbulence and a drive actuated rake mechanism for moving settled solids to discharge point for removing thickened solids, and removing clarified liquid. Bridge supported centrally driven thickeners are common up to 15 m dia side given figure shows a typical unit. The drive consists of a worm gear normally mounted on precision bearings and driven through one or more gear reduction by a motor. A vertical driving shaft is attached to the main gear. Normally two long and two short arms are attached to centre shaft. The long arms have sufficient blades to scrape the bottom twice per revolution. Short arms are provided to rake the inner area for times per revolution and balance mechanism. Cone scrapers are bolted to the centre shaft to prevent plugging of bottom discharge cone. KARYASIDDHI has the expertise in providing the right Thickener for your environmental needs.